John L. McLaughlin was born and raised in Saint John, NB, and misses the Atlantic Ocean, fog, dulse and Moosehead Beer. He earned a BA (Philosophy Honours and English Major) from St. Thomas University, Fredericton, NB, and an MA in Philosophy from the University of Toronto. He studied Theology and Scripture at the University of St. Michael’s College, where he earned an MDiv and PhD. After teaching at Wheeling Jesuit University in Wheeling, West Virginia for seven years, Professor McLaughlin joined the Faculty of Theology at the University of St. Michael’s College in July 2002. 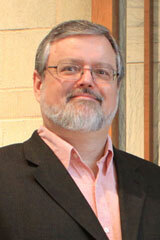 He is Associate Professor of Old Testament / Hebrew Bible and an Associate Member of the Graduate Faculty, Dept. of Near and Middle Eastern Civilizations, University of Toronto. He served nine years as the Director of Advanced Degree Programs in the Faculty of Theology, followed by terms as Interim Dean of the Faculty of Theology and as the Acting TST Graduate Coordinator. He is a past President of the Canadian Society of Biblical Studies and currently serves on the Editorial Board of the Journal of Hebrew Scriptures and as an Associate Editor of the Catholic Biblical Quarterly. An Introduction to Israel’s Wisdom Traditions. Grand Rapids: Wm. B. Eerdmans Publishing Co. In press. Justice in the Balance: Learning from the Prophets. Ottawa: Novalis Press, 2008. "Is Amos (Still) Among the Wise?" Journal of Biblical Literature 133 (2014): 281–303. "Religion of Ancient Israel." In Anselm Companion to the Bible, edited by Corrine L. Carvalho, pp. 152-67. Winona, MN: Anselm Academic, 2014. Also printed in Anselm Companion to the Old Testament, edited by Corrine L. Carvalho, pp. 150-65. Winona, MN: Anselm Academic, 2014. "Why Does God Have Many Names in the OT and Why Do We Need Them?" In Pastoral Essays in Honor of Lawrence Boadt, C.S.P. : Reading the Old Testament, edited by Corrine L. Carvalho, pp. 57-69. Mahwah, NJ: Paulist Press, 2013.